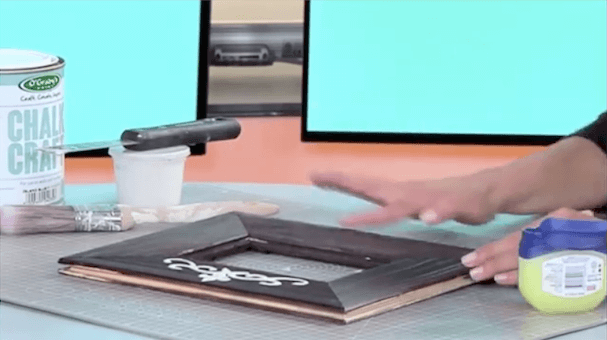 1.Create a raised stencil using Ogradys Skim and a stencil. Spread the Ogradys skim with a scraper on the stencil. Lift off stencil. If there are any smudge marks just remove it with a wet cloth or use a toothpick to straighten the edges and make correction while skim is still wet. 2. With your fingers apply Vaseline where you want to see the wood underneath the paint at the end of the project. Normally the edges and where natural aging would have occurred. The Vaseline won’t let the paint stick to the frame so it’s a very easy way of distressing furniture. 3. Paint over the frame and Vaseline with our Island Blue. 4. Once is dry, remove the paint with a scrapper where the Vaseline is sitting to create a chippy look. 5. To protect the final finished product seal the frame with our Clear Liquid Wax using a cotton cloth.